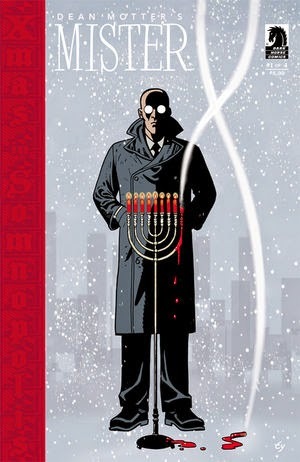 The Fellowship was fortunate enough to obtain a copy of MISTER X: RAZED #1 from Dark Horse Comics. Dean Motter writes, draws and colors. Radiant City is a failed experiment, an attempt to design the perfect city. But somehow it went wrong, instead slowly driving its citizens out of their minds. Now Mister X is trying to fix the problem, with the help of a few friends. Rosetta is a reporter covering a string of murders which turn out to be something very different. And Mercedes runs into problems of her own while working the late shift, problems which turn out to be related to Rosey’s. Radiant City turns out to be a fascinating setting for these stories. It blends noir and science fiction in a way that shows us something that’s both and neither, and the wintry holiday timeframe makes it even cooler (no pun intended). And the two stories blend together to give us a glimpse into the corruption of the city itself as well as the people in it. The art also helps to draw us into the noir-ish feel, and the colors (mostly red) hint at the bloody consciousness underneath. There are lots of layers in this book, so if that appeals to you, this is a great jumping-on point. Check it out. MISTER X: RAZED #1 is available now at your FLCS or at darkhorse.com.